Classic short stories of Sherlock Holmes now available in a separate, attractively priced individual volume. 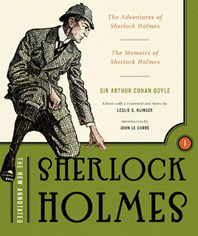 The publication of Leslie S. Klinger's brilliant new annotations of Sir Arthur Conan Doyle's classic Holmes short stories in 2004 created a Holmes sensation. Available again in an attractively-priced edition identical to the first, except this edition has no outer slipcase (Volume Two is available separately). Inside, readers will find all the short stories from The Adventures of Sherlock Holmes and The Memoirs of Sherlock Holmes, with a cornucopia of insights: beginners will benefit from Klinger's insightful biographies of Holmes, Watson, and Conan Doyle; history lovers will revel in the wealth of Victorian literary and cultural details; Sherlockian fanatics will puzzle over tantalizing new theories; art lovers will thrill to the 450-plus illustrations, which make this the most lavishly illustrated edition of the Holmes tales ever produced. The New Annotated Sherlock Holmes illuminates the timeless genius of Arthur Conan Doyle for an entirely new generation of readers.